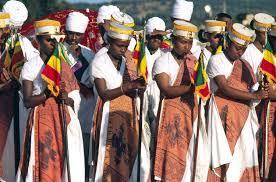 Today, I would like to talk about the Timkat Festival, which is an Ethiopian celebration of Epiphany. It is usually celebrated on 19 January or on 20 January on leap years (which is the 10th day of the Terr – Ethiopian calendar). This festival celebrates the baptism of Jesus Christ on the Jordan river by John the Baptist. It is particularly praised for its reenactment of the baptism. Pilgrims come from around the country to celebrate the Epiphany, which lasts three (3) days. During the ceremonies of Timkat, the Tabot, a model of the Ark of the Covenant, is reverently wrapped in rich cloth and borne in procession on the head of the most senior priest to a place near the river, where a special tent will be erected for it. The Tabot represents the manifestation of Jesus as the Messiah when he came to the Jordan river for baptism; this holy relic is also said to hold the ten commandments as handed down to Moses by God on Mount Sinai. The Divine Liturgy is celebrated near a stream or pool early in the morning (around 2 a.m.). Then the nearby body of water is blessed towards dawn and sprinkled on the participants, some of whom enter the water and immerse themselves, symbolically renewing their baptismal vows. 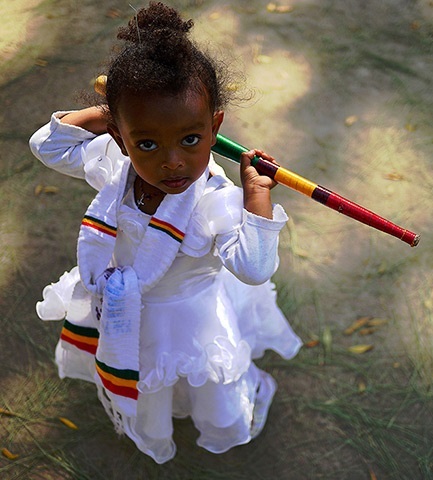 It is a feast of celebration, and processional crosses of varying size and elaboration as well as various Ethiopian artifacts can be seen on the occasion. Participants wear the traditional shamma, which is a thin, white cotton wrap worn like a toga and as headdress. The best place to attend the event is in Lalibela, Gondar, or Addis Ababa. The actual ark of the Covenant is said to be held in a place in northern Ethiopia, guarded by priests who have sworn never to leave the chapel grounds. Here are photojournals from The Guardian, the Huffington Post, and the BBC on the Timkat Festival; my favorite one is from the Guardian. Enjoy!! !